>> We use only roses of the very highest quality - our roses have very large voluminous rose heads with a long lasting vase life and are grown in some of the most optimal environmental conditions to produce premium roses. Roses from award-winning farms recognized for their exceptional quality, size, and quality control, and are eco-friendly sustainable farms. >> Ideal for weddings, holidays, floral arrangements, events, DIY projects, personal projects, a gift to a loved one or someone special, or a treat to yourself to avoid that weekly trip to the store for flowers that aren't nearly as fresh! >> Very versatile and long-lasting, and are perfect to combine with other bulk flowers and greenery to create unique and romantic wedding bouquets, floral arrangements, table centerpieces, holiday or themed parties and events, a date night surprise, a just because surprise, or to use its petals! >> Also, an ideal rose source for florists and flower arrangers - our roses as fresh as you can get, right off the farm, already largely cleaned (de-leafed & de-thorned) to avoid the time and pain of cleaning roses yourself, all at more affordable pricing than your local provider! For any industry providers with appropriate business licensing, please contact us for customized industry pricing. •	Average Stem Height: Typically 20+ inches. •	Average Bloom Size: Very large, 4 to 6 inches, but variety and season dependent. •	Average Vase Life: 8+ Days, with proper care and handling. •	De-Leafing & De-Thorning: Typically stems are largely cleaned (de-leafed & de-thorned) so that you don't have to go the trouble, time, or pain of de-leafing and de-thorning them yourselves! Longer stem lengths (up to 80cm / 32 in) may be available, please message us. 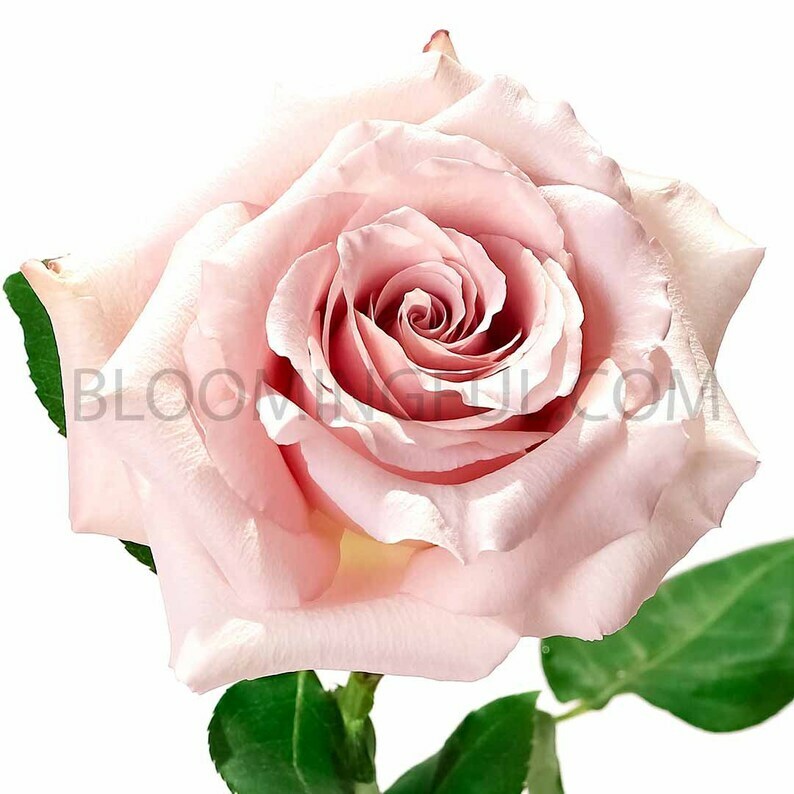 •	Availability & Product Variation: Available year-round; rose variety and exact coloring may vary slightly depending upon the time of the year. Generally, this rose variety must be ordered in advance, especially during wedding and holiday seasons! •	Product shipped direct to your doorstep using FedEx. •	Delivery Date: Roses are shipped in CLOSED BUD OR SEMI-BUD FORM, so we recommend a delivery date 3-4 days prior to your event or occasion so that your roses have time to fully bloom. For processing time, please allow up to 7 business days for orders (of 50 stems or less) and up to 10 business days for orders (of 50+ stems). Faster, expedited processing times and shipping are often available, but please contact us for details. You may also order now and request a FUTURE delivery date up to twelve months in advance – please send us a message with your requested future delivery date. Delivery available Tuesday-Friday; if you would like Saturday delivery, please contact us for details. •	Signature required upon delivery; no signature will void Quality Guarantee. •	Due to the perishable nature of the product, product must be appropriately cared for upon delivery. If there are any product concerns upon delivery, please contact us in writing (by Etsy message) within two hours of the delivery detailing any concerns and providing images of the concerns. •	Substitution Details: Flowers and greenery are a product of nature and occasionally, may not be available at your requested delivery date, even when you order in advance. When you order in advance, we reserve your product with the farm specifically for you so that it is available when your requested delivery date comes and there is rarely an issue. However, Mother Nature may take its toll (for example, bad weather, bad growing season, etc.) or some other issue may arise. If and when this happens, and we need to make a substitution to your order, we always try to contact you as early as possible to let you know so then you can decide what you want to do, and we always take the utmost care to make sure that your order is as similar as possible to what you ordered. If time does not permit us to contact you, in order to get your order to you timely, or we are unable to, we will make substitutes that are as close as possible to what you ordered, using flowers or greenery of equal or higher value. Family owned and operated. Our flowers and greenery come fresh direct from the farms and are renowned for its premium quality and freshness. All orders are made-to-order. (C) 2018. BLOOMINGFUL.COM All rights reserved. These flowers were gorgeous! Opened beautifully and lasted through the wedding...had them delivered 4 days ahead of the wedding and they looked lovely! Customer service. I have never had such good service. I ordered eucalyptus to use for table runners/center pieces for a baby shower and they were so quick to respond with questions, made sure I got the product on time and provided directions for storage. The center pieces turned out beautiful and I received so many compliments. I will order again. LOVE it, smells absolutely radiant!!! What is the processing time for my order? What shipping services & speeds are used? 1. Let us know that you would like Saturday delivery for your product when you order. 2. Purchase the Saturday Delivery Fee Product from our listings, in addition to the actual product itself. If this is not purchased, then product will ship out on its otherwise scheduled business day. 1. Cut 1/2 inch to 1 inch off bottom of stems. 2. Place in room temperature water. 3. Until you are ready to use your eucalyptus, keep eucalyptus (still in water) in a cool, dark place away from air flow (for example, air conditioner, heater, windy or breezy area, etc.). OR, if you have space in your refrigerator (or outdoor, if the outdoor temperature is similar to refrigerator temperature and good outside weather conditions), then keep your eucalyptus (still in water) in the fridge or outdoors until you are ready to use. 4. Replace water every 2-3 days. Keep eucalyptus away from direct sunlight, extreme (cold or hot) temperatures, and areas with significant air flow or breeze. What is your order cancellation policy or order modification policy? Due to the nature of the product, our default rule for order modifications or order cancellations is: we do NOT allow for order modifications or order cancellations. BUT... upon request by Etsy message, we MAY be able to make an exception and accommodate a request to modify your order or to cancel your order, on a case by case basis, with or without a stated reason. If we allow a modification or cancellation to your order, we will respond to you by Etsy message indicating that we have accepted your request for modification or cancellation.